When I was looking through various recipes for mint tea on the Internet, I discovered that there is a tremendous variety in the amount of fresh leaf that different people recommend. The quantities used varied from just half a dozen leaves or so, to large bunches per pot and, as a result, I was a little unsure what to try. Ultimately, I settled on a relatively small amount. Since I planned to use my 2 mug French press rather than our regular teapot, I selected 8 or 9 small sprigs, which worked out to about a quarter cup of leaves. I also chose to add a couple of slices of ginger and a scant teaspoon of sugar. Then, I added the ginger and boiling water. I let it steep for about 6 or 8 minutes and then served the resultant ‘tea’ garnished with very thin slices of lemon and an extra sprig of the mint. During the Victorian days, there were almost as many vendors of “peppermint” water as there were vendors of regular tea on the streets. The Brits considered it quite a treat – it was not drunk hot but rather (probably) at whatever the temperature was at the time of selling. 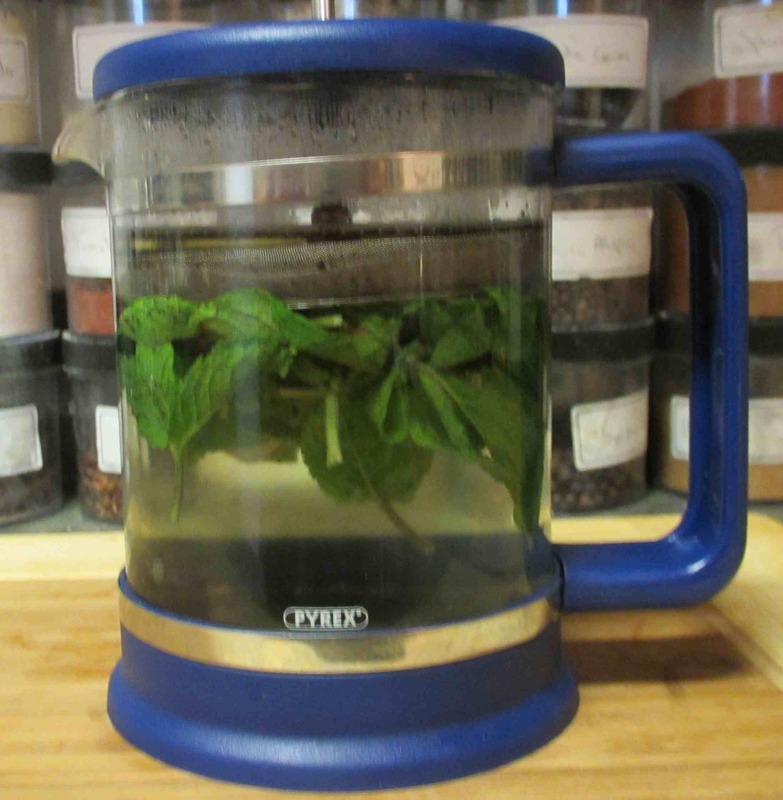 I like adding mint to my tea when brewing it for iced tea. I’ve never heard of that before…. It was also popular to drink the water in which barley was boiled… especially on hot days. Lemon was often added too. 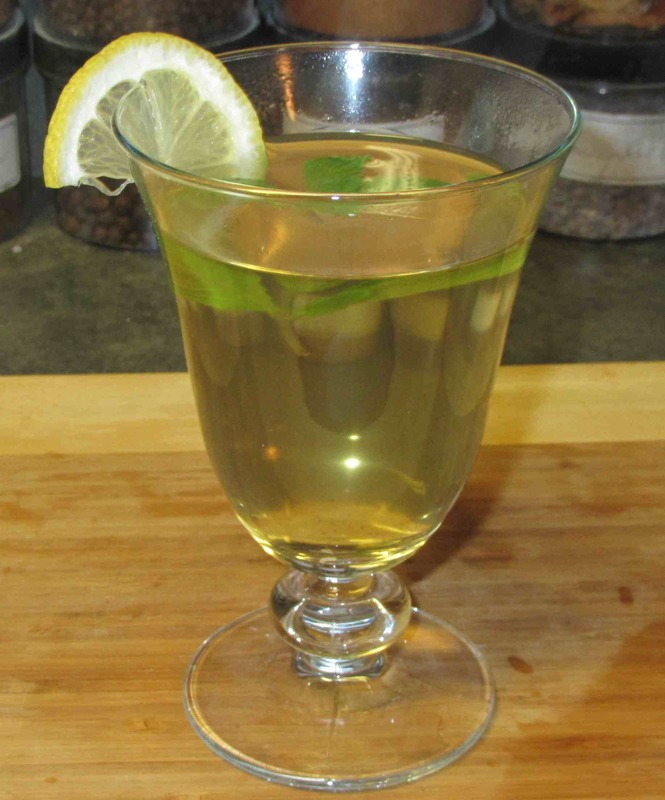 Mint tea always brings me back to Morocco– sweet and satisfying– most of the time. I love drinking tea, almost always using tea bags. My favorite is jasmine green. 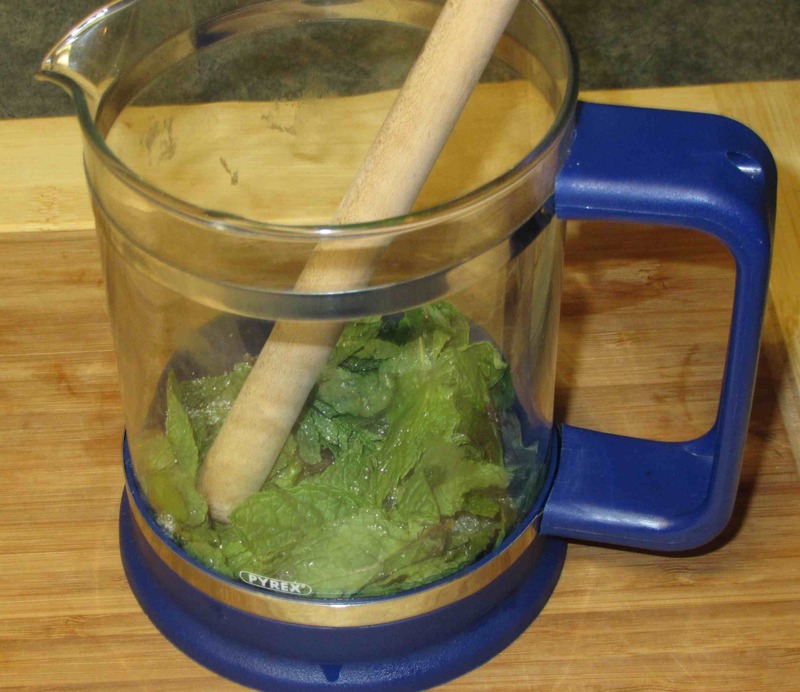 I’m not a big fan of mint tea, but I’m going to try using fresh mint and your recipe. I’ve got a feeling I might enjoy that more. If you experiment with other ingredients, would like to read how that turns out. I may do another post or two … right now we are having green tea with Goji berry. We also have Rooibos tea with mint and acai berry quite often. Sounds great! Can’t wait to try. I love tea and have lots of fresh mint. Good for the digestion … very nice with chamomile too! Have you ever added fresh mint to a fresh fruit salad? It adds a whole new dimension. I’ll try that with the fruit salad…. I bet it works nicely! MAgic! Have you tried adding chopped mint leaves to green salad? My experience has been that the quality of the mint, and what time of day it is picked, dramatically affects the flavor and hence, amount to use in a recipe. With fresh mint, I bruise it between my fingers to get a sense of the amount of oils in it. It is such a great flavor, especially with lemon and ginger! So far, we are limited to whatever quality remains after the transportation North. My wife is going to try growing some indoors. It is so neat to grow your own. We are lucky to have a rosemary bush doing quite well this year despite our drought. Even when you grow your own, there can be a huge range of oils produced by the plant. I do an informal “test” to get a sense of the strength. I have mint and ginger in the cupboard — You’ve inspired me to go make a cup! You only need a few leaves and you can brew two pots from it, definitely worth a go! Silver needle is a white tea, it’s very delicate and has a slight touch of melon and cucumber flavours. I drink this most days whilst at work, or Japanese supreme sencha. I love white tea … and we have none in the house right now. I’ll make sure to select the silver needle for our next purchase. My wife is on her monthlies as of last night so we are drinking Raspberry leaf and Valerian for the medicinal effect and peppermint, honey and lemon for added enjoyment! I’m going to try it iced too. I don’t think you can overdo it in terms of one or two drinks… the taste would be just too strong. I really can’t see there woud be a problem with just a little every few days or so. Your tea looks wonderful. My go-to tea throughout the summer is iced tea. I take 3-4 stems (6″ or more long) bruise it a bit and throw it in the pot to steep along with my tea. After steeping, I take everything out and allow it to cool, then store in refrigerator. 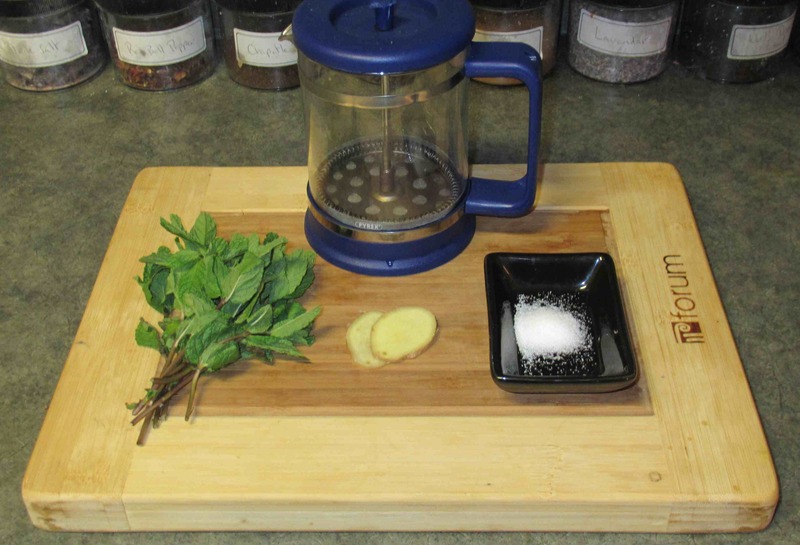 It is a great way to use mint and adds a hint of flavor to the iced tea and is very refreshing. I grow mine in pots, (up to 5 pots now.) It is easy to grow and easy to start if you take clippings from a friend (roots easily in water, the plant.) Grows well in the ground too, but can be invasive. My mom has HUGE patches in the ground in Minnesota and it comes back in force every spring. I prefer mine in pots so I can control it. Also, Thanks for stopping by my blog! I just bought some fresh sprigs yesterday … I will try rooting it. Thanx for the idea!! That’s funny! Exactly this combination I’ve had in mind to try since a few days. Because I drink fresh ginger tea and have fresh mint in my fridge.